What to know before you come to class. It is not necessary to pre-register for class, however, you can do so by signing up on the schedule. If this if your first time at Etowah Valley Yoga, please arrive 10 to 15 minutes early to complete a registration form and familiarize yourself with the studio. 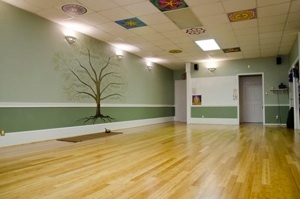 Etowah Valley Yoga is a well-equipped yoga center. It is not necessary to bring any props – or even a yoga mat! If you have your own mat and props, you are welcome to use them. Please ensure your mat is a yoga (sticky) mat – some exercise mats are not suitable for yoga. We are well stocked with blankets, bolsters, blocks, props and more. Please arrive a few minutes early for every class. We do start and end on scheduled time and it is disruptive to the other students if someone arrives late or leaves early. All cell phones should be turned off while you are in class. If you are expecting an emergency call you may keep your phone on vibrate but please excuse yourself from the room when you answer and talk! Use common sense about coming to class if you are sick. Do not come if you think you might be contagious – we will be sharing everything from the air to props. Please tell the instructor if there are any injuries or illnesses that she or he should be aware of before class. Remember that yoga is about self-care – and this may mean taking a break to take care of you. I can’t touch my toes – can I still practice yoga? Absolutely! Yoga is not a competition. You are the best judge of how deeply to work in a pose. Many of our day to day activities, such as driving, sitting and working on a computer, cause muscles to shorten – yoga helps lengthen those muscles. If you need help modifying a pose please ask. We are here to help you make this a positive yoga experience. Both Etowah Valley Yoga and Yoga, Etc. offer a changing space and cubbies or shelves for your belongings. Our studios are equipped with water coolers and refrigerators. Both studios offer a small lobby and retail space for your convenience. Read more about our two locations here.